Invasive species are a global problem, which costs the world economy billions of dollars and world ecosystems millions of tons of herbicides, pesticides and other cides. Anthropogenic translocation of freshwater copepods associated with early shipping activities was postulated for some time, but was never tested with molecular tools. 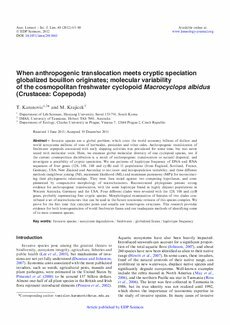 Here, we examine global molecular diversity of one cyclopoid species, test if the current cosmopolitan distribution is a result of anthropogenic translocation or natural dispersal, and investigate a possibility of cryptic speciation. We use patterns of haplotype frequency of DNA and RNA sequences of four genes (12S, 16S, 18S and cytB) and 11 populations (from England, Scotland, France, Germany, USA, New Zealand and Australia) to test inter- and intrapopulation variability, and three different methods (neighbour joining (NJ), maximum likelihood (ML) and maximum parsimony (MP)) for reconstructing their phylogenetic relationships. They were then tested against two competing hypotheses, and complemented by comparative morphology of microcharacters. Reconstructed phylogenies present strong evidence for anthropogenic translocation, with the same haplotype found in highly disjunct populations in Western Australia, Germany and the USA. Four different clades were revealed with the 12S, 16S and cytB genes, probably representing four cryptic species. Morphological examination of females of two clades contributed a set of microcharacters that can be used in the future taxonomic revision of this species complex. We prove for the first time that cuticular pores and sensilla are homologous structures. This research provides evidence for both homogenization of world freshwater fauna and our inadequate methods of identifying some of its most common species.